Patty Carroll has been known for her use of highly intense, saturated color photographs since the 1970’s. 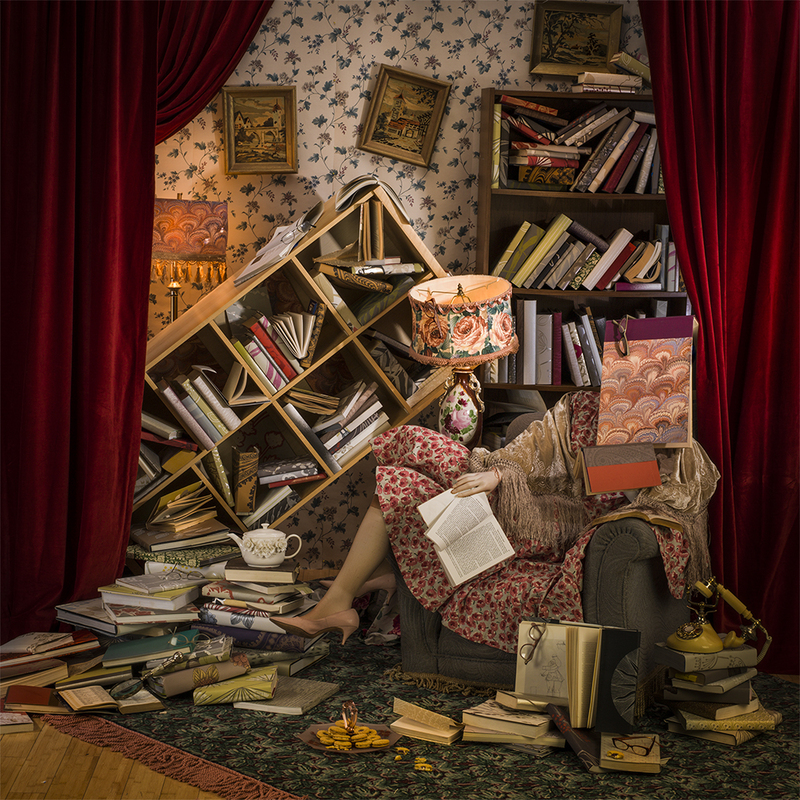 Her recent project, “Anonymous Women,” consists of a 4-part series of studio installations made for the camera, addressing women and their complicated relationships with domesticity. 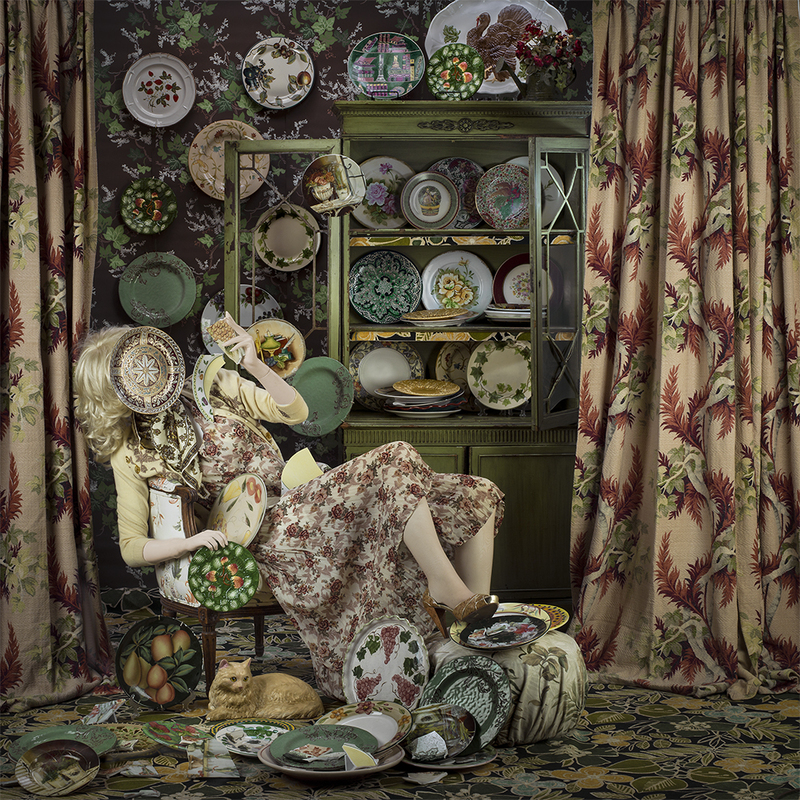 By camouflaging the figure in drapery and/or domestic objects, Carroll creates a dark and humorous game of hide-and-seek between her viewers and the Anonymous Woman. The photographs are exhibited in large scale were published as a monograph in 2017 by Daylight Books. 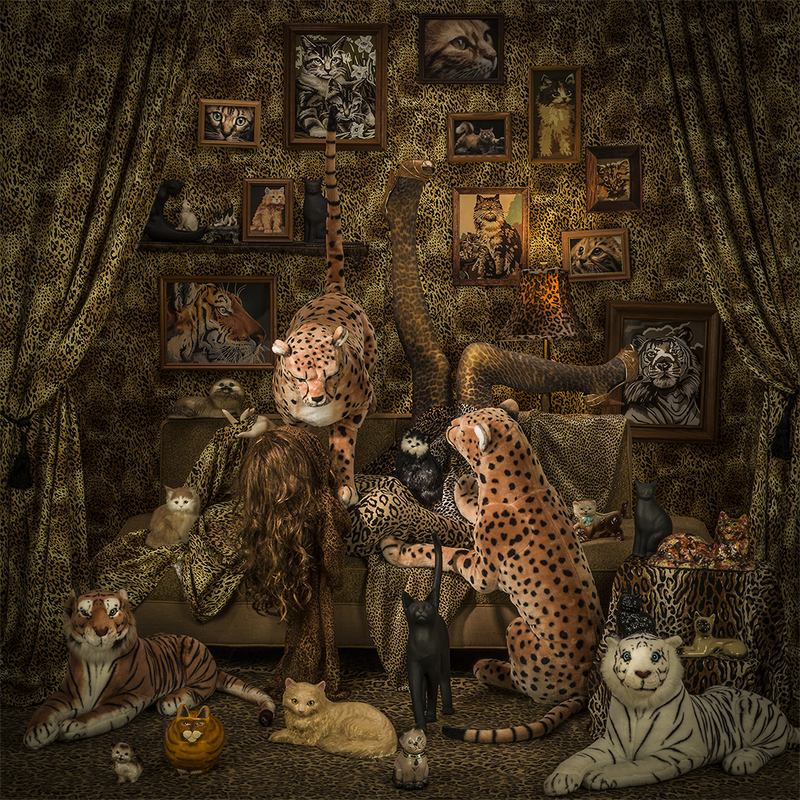 This series has been exhibited internationally, has won multiple awards, and acknowledged as one of Photolucida’s “Top 50” in 2104. Carroll’s work has been featured in prestigious blogs and international magazines such as the Huffington Post, the BJP in Britain, and NYT LensBlog. After teaching photography for many years, Carroll has enthusiastically returned to the studio to delight viewers with her playful critique of home and excess. Grants/Prizes include 2003 Artist Fellowship, Illinois Arts Council, 2011 Art Takes Miami, Photography Category, 2014 Photolucida Critical Mass: Top 50. Selected one-person museum exhibits include: Museum of Contemporary Photography, Chicago, Art Institute of Chicago, Royal Photographic Society, Bath, England, State of Illinois Gallery and Museum, Blue Star Art Space, San Antonio, TX, White Box Museum, Beijing, China, Northern Illinois University Art Museum, Chicago Cultural Center, Zheijhang Museum of Art, Hangzhou, China. The Anonymous Women series will be shown at the Kemper Museum of Contemporary Art in 2018. Artist Residences include: Akiyoshidai Arts Village, Japan, Anderson Ranch, Colorado, Texas A&M University, Columbia College, Chicago, and currently AIR at Studios Inc. in Kansas City, MO. Work included in many public and private collections, including: The Art Institute of Chicago, MOMA, MOCP, MCA, The Sandor Photography Collection, The Kansas City Collection, The Nelson Atkins Museum of Art, The Ruttenberg Foundation among others. The subject is the merging of woman and home. In the previous photographic series, “Anonymous Women: Draped,” a lone woman is hidden in a draped vignette with an occasional domestic prop or piece of furniture, where she performs domestic trickery. In the ensuing series, “Anonymous Women: Reconstructed,” the woman becomes part of her excessive domestic trappings and activities. 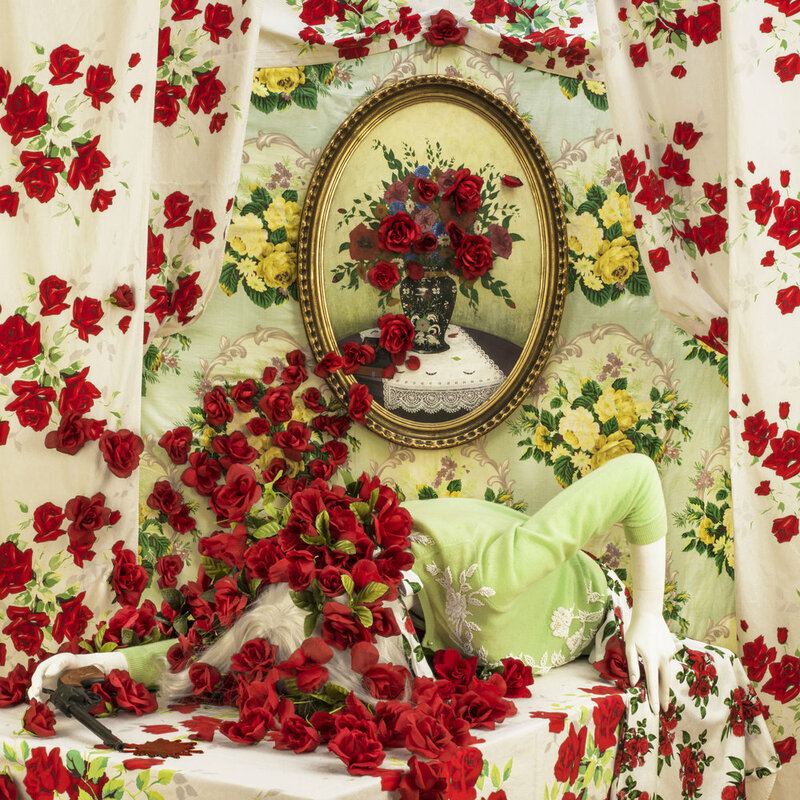 “Reconstructed” is commentary on obsession with collecting, designing, and decorating, inviting hilarity and pathos in our relationship with “things.” The photographs are life-size installations made in the studio using household objects as subject matter. A mannequin substitutes for the woman, where camouflage and anonymity reaches its logical conclusion of extreme absurdity, as she perpetually disappears into the artifice and visual overload of colors and patterns in her environment. Finding the anonymous woman in the chaos becomes an interactive scavenger hunt. In the newest narratives, “Disasters,” the woman becomes the victim of her home, to her fatal end. Her home has become a site of tragedy and danger, with scenes of heartbreaking mishaps and horror, inspired by many sources including the game of clue. The scenes and narratives that I create in the studio are about women who use their objects and décor to shore themselves up against a dark, scary world. Obsessing and perfecting home life with its objects, decoration, and activities fill a void of futility, and invents usefulness beyond caring for family or career. Growing up in the suburbs of Chicago provided the basis of all of my work, and I continually seek to come to terms with the myth of perfection and illusion. I am photographically creating worlds that debunk, critique, and satirize the claustrophobic perfection of expectation.